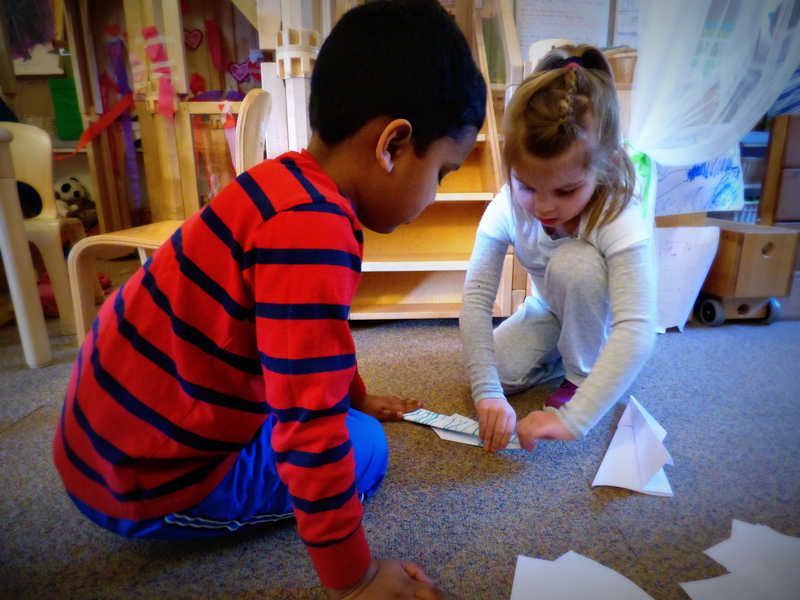 Once our paper airplane class was underway, many children volunteered to begin teaching immediately. Almost every child staked out a zone and set up their class. Peeking in the room, you would have found 11 Student Teachers and 1 student. Within a few minutes, they began to notice the problem. There were no longer any students to come learn their lessons. We realized that we’d need some procedures set in place. Naturally, we asked the children how the system should work. L: There should be six teachers and six students. If everyone is there, it will be an equal amount. W: We should solve it without too many teachers. Z: There would be fewer students than teachers. There are so many that want to be teachers. then they should switch. They would keep switching. K: If we are missing someone, we’ll have 11. We should pick who goes first using the Morning Circle. These people [points to the left] go first, then they switch. M: Six students will be one one side and six on the other side of the room. Two people will be teachers and all of the rest of the kids will be students. A: You should have to stay with the same teacher the whole time. N: Mrs. Forst and Mrs. Pless should be students. S: Teachers can be picked by line order. K: We can have one teacher at a time. Many lively discussions followed, including hashing out the method for Student Teacher assignment. The group finally settled on three teachers each day, selected alphabetically.